A neuroscientist and internationally recognized expert on sport-related concussions, Kevin Guskiewicz joined Carolina’s faculty in 1995 and has served as dean of the College of Arts & Sciences since January 2016. As interim chancellor, he will chart a course for the University of North Carolina at Chapel Hill. UNC System Interim President Bill Roper appointed Kevin M. Guskiewicz as UNC-Chapel Hill’s interim chancellor Wednesday, Feb. 6. Dean of the College of Arts & Sciences, Guskiewicz will assume his chancellor responsibilities immediately. Guskiewicz succeeds Carol Folt who served as chancellor July 2013 through January 31, 2019. In appointing Guskiewicz to this role, Roper said he was looking for someone who was ready to serve as an active leader, a person who was well known, and who knows Carolina well. He sought someone who can chart a course for Carolina and someone who has gained the trust and support of the community. Dean of the College of Arts & Sciences since January 2016, Guskiewicz oversaw the largest academic unit at UNC-Chapel Hill with more than 17,000 undergraduate students, 2,400 graduate students, and more than 70 academic departments, curricula, programs, centers and institutes. 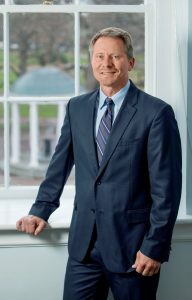 Over the past three years, Guskiewicz has prioritized interdisciplinary teaching and research, active learning techniques and experiential learning opportunities for students. He has also overseen the revamping of the General Education curriculum, the first significant overhaul more than a decade. Under Guskiewicz’s leadership, the College has raised more than $400 million, well over half of its goal of $750 million during the Campaign for Carolina, which runs until December 2022. A neuroscientist and internationally recognized expert on sport-related concussions, Guskiewicz joined Carolina’s faculty in 1995. His research has influenced concussion guidelines and recommendations made by several organizations including the NCAA and the NFL. Guskiewicz is the Kenan Distinguished Professor of Exercise and Sport Science, founding co-director of the Matthew Gfeller Sport-Related Traumatic Brain Injury Research Center and director of the Center for the Study of Retired Athletes. He holds appointments in the department of orthopaedics, department of physical medicine and rehabilitation, the UNC Injury Prevention Research Center and doctoral program in human movement science. Guskiewicz earned a bachelor’s degree in athletic training from West Chester University, a master’s in exercise physiology/athletic training from the University of Pittsburgh and doctorate in sports medicine from the University of Virginia. He and his wife, Amy, have four children, two of whom are undergraduates at the University. Read the University of North Carolina system announcement.